Born and raised in Portland, Oregon, I graduated with an International Bacclaureate Diploma from Tigard High School. Following high school, I moved to Denver, Colorado in 2012 to attend the University of Denver. I received my bachelor's degree in Chemistry with minors in Leadership Studies, Math, and Psychology in March 2016. While at the University, I was involved with the Pioneer Leadership Program, Delta Delta Delta sorority, and YoungLife, as well as other clubs on campus. The University of Denver gave me the opportunity to study abroad in Vina del Mar, Chile. After graduating, I also took a backpacking trip for three months through Eastern and Northern Europe. Both of these experiences allowed me to see other cultures and have carried through to my work experience here in the United States. Upon returning to the United States, I moved to Phoenix, Arizona to become an AmeriCorps VISTA. The AmeriCorps VISTA program is a one year immersion program that allows participants to experience living in poverty while serving communities in poverty. I joined this program because I have been involved with helping the homeless for 9 years and saw this as a unique opportunity to execute on that passion before launching my career full time. 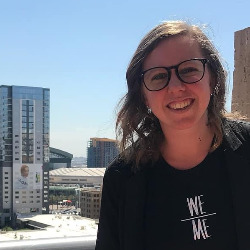 I worked in the Phoenix Mayor's Office learning a new aspect of confronting the issue of homelessness through the policies and opportunities of working for the City of Phoenix. After my VISTA experience, I realized my love for those experiencing homelessness and decided to continuing working in the field. I joined Mayor Stanton's Office and continued to work on human service related issues around homelessness. When he resigned to run for Congress, I moved to the non-profit sector to continue working on homelessness and affordable housing at the Arizona Housing Coalition and now work as a Human Services Planner for Maricopa Association of Governments specifically working on how to develop system level coordination to address homelessness.